Sudden changes wake us up. Something or someone upends our enduring beliefs, and way of life, sooner or later. We name these events and tell our story in a state of amnesia, forgetting that there are seasons, cycles and the infinite unknown, present and influencing our lives naturally and continually, even when things look bad. When a person has a near miss or a near death experience, a visceral awakening to the brevity of a lifetime occurs. Perspectives, interests, priorities and consciousness quake and shift. I woke up after a near death experience with ninety-six staples from stem to stern. Ouch. I had been a very busy person, on the go, with a never ending “to do” list, always improving things, excited about life and making a difference, curious and willing to grow. Boom. The moment I realized that this was it, my life was ending, a single awareness remained: How can this be over…I have done nothing. That’s right Ms. Busy Accomplishing had done nothing. Trust me, this is not a good feeling when your last breath is immanent. After that experience I had one primary animating desire: When I inevitably arrive at that moment again I would be grateful to feel very differently. I had no idea what would change, how my life and world would shift. I was open. 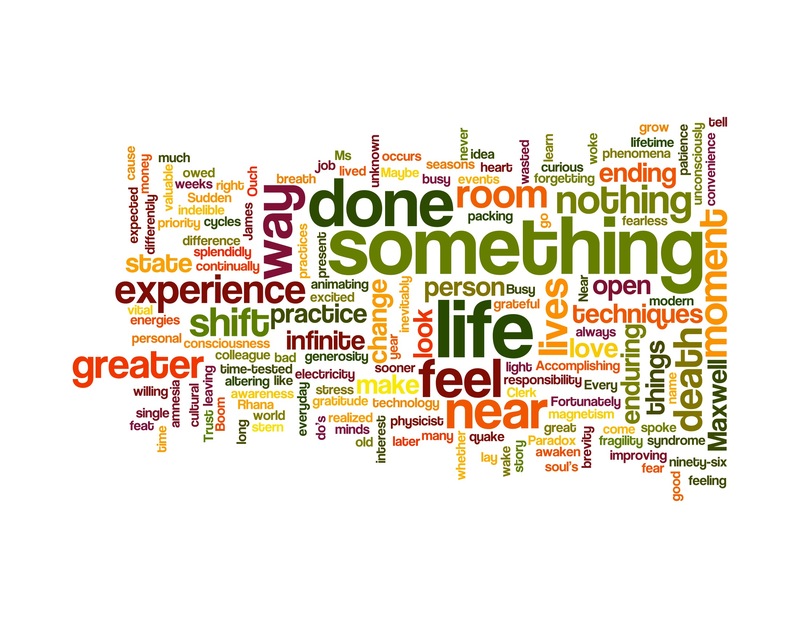 What would “doing something” feel and look like? Is this our cultural problem? Do we squish everyday, moment and year, packing time with infinite and important “to do’s” leaving no room for something greater to come through? Maybe the enduring state of “to doing” was the cause of my sense of having done nothing. Paradox. Near death and near misses change us. We learn and long to power up to “something more”. 1. If you don’t love or have passion for what you do, whether it is a job or a responsibility, find a way to love the way you do it. The energy of “the way” is as vital as “the what”. 2. Practice fearless generosity by sharing something that is valuable to another, that is not owed or expected and that money can’t buy. 3. Replace feelings of fear with embodied gratitude, no matter how fleeting. We make room for the “something more” with patience and practice. Rhana…so beautiful and inspiring!!! I especially love your number 3 and realize that is where I need to focus much of my energy! Thank you Diane. Yes, number three is a power up and for me it is an aspect of “the way” in number one. When I recall that embodied feelings are a form of engagement (the way) it is easier for me to shift from fear to gratitude or, at least open to gratitude. We are certainly tested by both world and personal events. Thank you Rhana. Your blog gives me goosebumps. I relate to it very deeply.